'My great-grandfather came from Lithuania.' Netanyahu meets Lithuanian president during Baltic trip, says visit has special meaning for him. 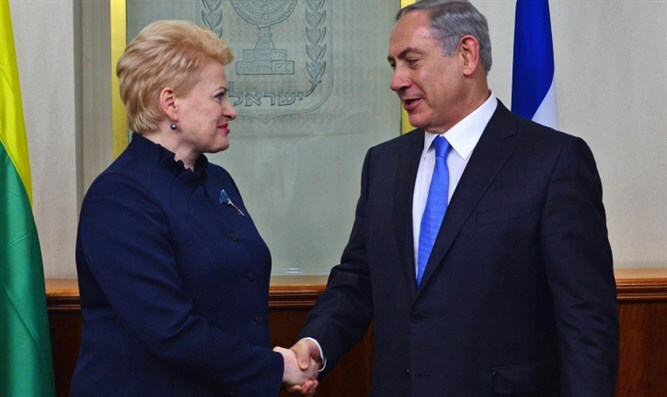 Prime Minister Binyamin Netanyahu met Friday with Lithuania’s president, Dalia Grybauskaite, at the presidential palace in the capital city of Vilnius. Netanyahu responded by saying that he was excited about the first official state visit by a sitting Israeli head of government to the country, saying that it had both important “historical meaning”, as well as personal significance. "I have to tell you that this is not a regular visit for me,” said Netanyahu. “It's full of historical meaning, both the history of the Jews here in Lithuania and also my personal history, my family's personal history. My great-grandfather came from Lithuania." The Prime Minister flew to Lithuania on Thursday, the first by an Israeli premier, to attend a conference of Baltic leaders.